The ‘Odyssey of Love’ is one embarked on by Franz Liszt, whose phrase it is. The objects of his passion - and the epistolary revelations heard in this two-disc set - form the primary focus of what is a theatrical presentation with music. 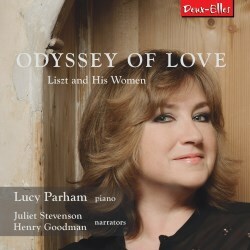 Through these letters and surviving diaries pianist Lucy Parham has arranged a non-chronological narrative that explores the two greatest of Liszt’s loves: Marie d’Agoult and the Polish Princess Carolyne Wittgenstein. Removing chronological constraint allows Parham to play mood against mood, and to structure the emotional and musical battles of Liszt’s life in an effective arc. Interspersed between the narrations, by Henry Goodman and Juliet Stevenson, is the music, all of which is heard in full, with the single exception of the opening track with Consolation No.3 – though the whole piece is heard in full on the second disc. Parham has done this before – ‘Beloved Clara’ was an earlier success for her – and this latest Lisztian interweaving musico-biography has a rapt quality that is strikingly enhanced by Parham’s sympathetic, idiomatic, and stylistically acute pianism. Her playing of Chasse Neige is especially notable, but she maintains a high interpretative stance throughout. Any notion that she would be prepared to coast negligently on theatrical coat-tails can be immediately scotched here and now. It helps that she has two of Britain’s best actors to hand. Goodman lends real flair to his portrait, whether mugging - somewhat Hercule Poirot style - as a French critic or interjecting some ‘what, whats’ into his Liszt portraiture, to create a greater sense of theatrical verisimilitude. Maybe the idea was Parham’s – but I’d wager it was Goodman’s. One thing, however, about Goodman’s portrayal; he dons a French accent for the critic, and assumes an aristocratic German Weimar but plays Hans Christian Andersen straight, in standard English. Why not all accents – or none? This would make – and has - an effective concert hall or theatre entertainment. It would also function well as a radio presentation which is, in effect, what we have with the CDs. The musical excerpts, as noted, are finely played and the two actors are second-to none in this kind of thing. What could Parham tease out of Brahms, I wonder?